The world's tallest tropical tree has been discovered in Borneo. Located in a protected forest reserve in Sabah, Malaysian Borneo, the tree reaches a height of 94.1m. National Geographic reports that Greg Asner of the Carnegie Airborne Observatory (CAO) revealed the new record holder this week at the 2016 International Heart of Borneo Conference. 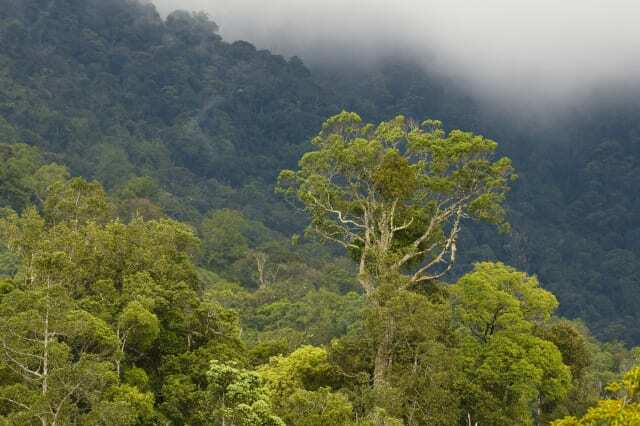 Earlier this year, a team of researchers believed they had found the tallest tree in Maliau Basin, measuring 89.5m but after concurrent laser scanning across Sabah's forests showed one huge tree on a hillside in Danum Valley measuring 94.1m. California redwoods are the tallest known trees anywhere and measure 116m. Speaking to Mongabay, Asner said: "This tallest tropical tree, and the 49 runners-up, are truly phenomenal expressions of the power of nature. "Conservation needs inspiration, and these sentinels of the Bornean jungle provide that to us. This discovery is a gift to science, to the people of Sabah and Borneo, and to the world." Taranaki is one of New Zealand's best-kept secrets: only two per cent of New Zealand’s international visitors currently bother to venture out this way. But a new motto – ‘A Little Bit Out There’ – offsets the region’s remote location. In nearby Egmont National Park, meanwhile, a magnificent hiking trail is emerging from the shadows to challenge the Tongariro Alpine Crossing as the country’s finest one-day walk. Blending amazing nature and super-cool Iberian culture, the Azores has been labelled the ‘next Iceland’ - and not just because of the archipelago’s positioning as a cross-the-pond pit stop between the US and Europe. Its natural assets resemble an array of superlative sights pulled from other destinations: lush Hawaiian volcanoes, medieval Portuguese villages, gurgling Scandinavian hot springs, towering Irish cliffs and rugged Patagonian craters. The secret won’t last: the Azores have seen a 31% increase in tourism over the past 12 months, so visit in the 2017 sweet spot before things really take off. North Wales comes fourth on the list of the world's top ten must-see regions for 2017. Tom Hall, Lonely Planet’s Editorial Director, says: “It’s a stunning area with a vast array of activities on offer to keep travellers entertained." Surf Snowdonia is perhaps the most headline-stealing example of North Wales’ reinvention: the machinery of this inland lagoon generates the world’s longest surfable human-made waves. Meanwhile Zip World at Penrhyn Quarry boasts the world’s fastest (and Europe’s longest) zip line. The same folks run Bounce Below: giant trampolines strung in the caverns beneath Blaenau Ffestiniog, one-time capital of Wales’ slate-mining industry. Capping things off, Snowdonia National Park – Wales’ largest – has been designated a ‘dark-sky reserve’ thanks to its lack of light pollution. Its climate may be hot, but South Australia offers a wonderful mix of brilliant wine country, abundant produce festivals, stark and stunning tracts of picturesque Aussie outback and crowd-free beaches that could make even the Bahamas jealous. The Queen Mary 2 is putting South Australia on her travel list in 2017, choosing to dock not only in its artistic capital, Adelaide, but also taking in the rustic charms of Kangaroo Island (pictured). There’s only one road into the Aysén region of Chilean Patagonia, and if you follow its unpaved contours from start to finish, "you’ll experience a kaleidoscopic journey where foggy fjords give way to brooding rainforests, bone-dry pampas and powder- blue lagoons," says Lonely Planet. Shaped by the forces of the Patagonian Ice Field – Earth’s third-largest freshwater reserve – Aysén is an extreme landscape in constant flux. But with fresh routes to glaciers, a booming craft-beer scene in remote hamlets and a massive new nature reserve green-lit for national park status, Patagonia’s last frontier has never been such a delight to explore. A string of coral encircling a luminous turquoise and jade-green lagoon, Tuamotus is one of the world's greatest dive destinations. From the air, the atoll - the second largest in the world - seems to be a giant pearl necklace laid upon the water. Here is a world where 240 tiny islets, or motu, each no more than three feet in elevation, lay upon the ocean for more than 110 miles completely encircling an infinitely deep lagoon. Surrounded by two legendary bodies of water, Moana-tea (Peaceful Ocean) and Moana-uri (Wild Ocean), the main villages of Avatoru and Tiputa offer a unique look at the South Pacific. Along the few roads, coral churches, craft centers, local restaurants, and tiny shops provide enjoyable land-based experiences to complement the many activities in the lagoon. The Tuamotus are billed as ranking among the world’s best dive destinations, and that reputation has never been so justified: the number of dive areas is growing, and a new live-aboard dive boat is launching in 2017. Just beyond Savannah lies a coastline complete with quirky towns, historic treasures and wilderness-covered islands. Hollywood has recently started to take notice of this wonderful hidden gem, and major movies including the Baywatch reboot, set to release in summer 2017, are increasingly being set here. So if you’re seeking a coastal getaway of uncommon beauty, with plenty of adventure and without the crowds, go now, before the secret gets out. Perak's capital, Ipoh, has a beautiful old town located to the west of the Kinta River. Ipoh came into existence in the 1820s as a village at the highest navigable point of the Kinta River. Lonely Planet describes it thus: "vintage cafes and cheerful joints, pulling a vibrant crowd to shop, dawdle and slurp ais kepal (ice balls). Guesthouse owners and tour guides on Pangkor Island are starting to lead sustainable nature walks and village tours. In this sunbather’s paradise, an emerging focus on wildlife is a breath of fresh, sea air. A long time ago, far, far away… a small band of monks established a hidden base on a remote, wave-pounded hunk of rock rising out of the Atlantic like a giant triangle. With a setting like this, it’s no wonder Skellig Michael made the new Star Wars location list. To get to this far-flung isle, a boat trip is necessary from the Skellig Ring, perhaps Ireland’s most charismatically wild and emerald stretch of coastline. Glimpsed at the end of The Force Awakens, Skellig Michael will play a bigger role in this year’s sequel and local businesses are gearing up for the expected visitor bump.